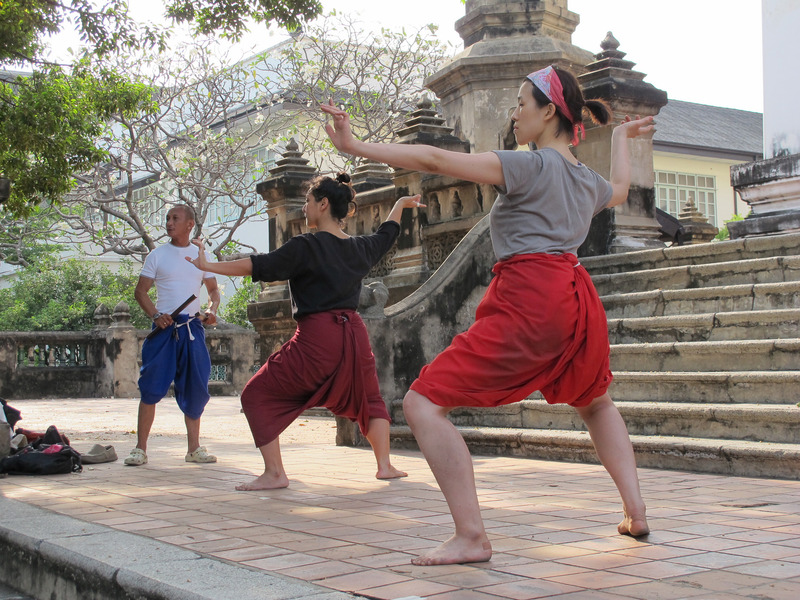 Arts on Location has organised this workshop in Bangkok in order for the participants to experience and train in this traditional theatre form on location. Therefore the participating artists will discover the cultural context and environment in which this theatre practice was born and developed. Arts on Location’s anthropological approach aims at providing not only a high quality theatre workshop but a well-rounded cultural experience as well. Taking Place in Bangkok, this workshop is a skill developing cultural programs aiming at performance artists and theatre practitioners from all over the world who have a strong interest in gaining good grounding knowledge in the art of Khon. The focus of the 3 week training will be on Khon with a subsidiary subject taught each week. The following subsidiary subjects will compliment and enrich the participants’ learning experience: Krabi Krabong (Thai Weapon Arts), Nang Yai (Shadow Puppets), Muey Thai(Thai Boxing). If demand is high, there is a possibility of arranging for additional subjects, such as Thai Classical Music, Thai rod puppets, and Hun Lakorn Lek (Thai Puppets), etc. Notes: Hun Lakorn Lek training will not be inclusive of the fees. Note: The Timetable will be provided prior to the beginning of the training programme.